After selling above $25 to scale partial gains, my ultra-long gold position, DGP, has come cratering down today. With a small loss now, I sold the final piece of the position at $23.90 from my $24.12 entry. The loss is quite small. And considering I got out with wins in NUGT early last week and the first piece of DGP, I am pleased to have avoided the metals and miners dishing out their typical heartbreak like they are this afternoon to bulls. 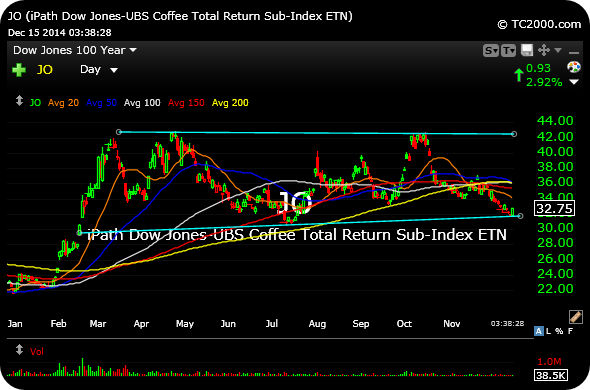 I also went long JO, the ETN for coffee, at $32.77 here, placing 4% of my trading portfolio capital into it. I like the way soft commodities, namely CORN WEAT, have been trading of late. And coffee is at the bottom end of a multi-quarter range, finding some buyers today, seen on the daily chart, below, JO. My stop-loss is if JO loses $31.60, though I may cut it sooner as I am playing for an imminent snapback rally higher. As you can see, I am remaining opportunistic for inter-market trades in lieu of getting involved in equities, for the most part, as they are still a mess. More in my video market recap after the bell.